I expected TRIUM to open up a few doors, but it really opened up new directions for me. 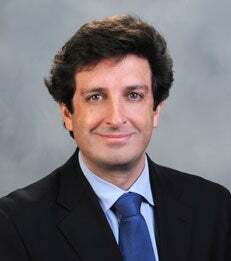 Miguel de Almeida is a Lisbon native with prior experience working in a family-owned real estate development firm, where he's still in an advisory capacity. He also was a banker with the largest private bank in Portugal and with Chase in Madrid. Additionally, he's done some other entrepreneurial things that currently hold most of his focus. While Miguel entered TRIUM with the expectation to develop his finance and marketing skills, he left with an idea for a brand-new business and a ready-made group of colleagues. Since graduating from the TRIUM program in 2011, Miguel, and five TRIUM classmates – Kirby Wanner, Stephen Kubicki, Lorne Gavsie, Ivar Borge and Ryan Bogan – have nurtured their professional relationship, born in TRIUM's global incubator, from concept to reality. The business they have created together, Blue Buffalo Enterprises, focuses on early-stage business development and seeks out "project opportunities that present viable growth scenarios," according to Miguel. "We provide a privileged international doorway to new markets, funding opportunities and personnel, so project owners can gain access to global prospects by partnering with us." Miguel and his colleagues at Blue Buffalo worked together on the end-of-program term project at TRIUM, which focused on the utilization of waste heat to provide energy. Though the project didn't have legs, the team did. "We learned we have complementary skill sets, different world perspectives and the ability to bring out the best in each other," Miguel explains. "Collectively we decided to move forward and do something concrete." With the team spread out from North America to Europe and Australia, it's no surprise Blue Buffalo's projects are equally dispersed. The first venture to get up and running is a Toronto-based, North American software start-up called Waabii, whose business line will build on a core software innovation solution developed in Portugal. Fellow 2011 TRIUM alumni Jesper Bank and Shrav Malkani have been drafted into the initiative, with the BBE team also taking an active role in its development. Not far behind is a Portuguese medical-device maker that is benefiting from the Blue Buffalo team's expertise in strategic direction and operations know-how. The team is also shepherding a project based in Australia and is continuously seeking other opportunities – including, Miguel emphasizes, from other TRIUM graduates. An active alumnus who wears the TRIUM colors when he plays polo and races sailboats with other alums, Miguel concedes he got much more than he bargained for from the TRIUM program. "I expected TRIUM to open up a few doors, but it really opened up new directions for me," he says. "It led me down a certain path I hadn't thought of and helped me realize my potential."